At some stage next week I’ll be debuting the first edition of my Video Show The 10 Minute Gardener. So What Is The 10 Minute Gardener? The 10 Minute Gardener is going to be a regular video show that will be posted on my YouTube channel – and I’ll embed every episode here on my website too. Now the whole idea of the 10 Minute Gardener has come from my Mum, Betty. Now Betty likes gardening – in fact, she’s been a gardener all her life – but what she really loves do is cook. And Betty really wants to cook using vegetables and herbs that she’s grown herself. And that she can pick fresh whenever she needs them. But she’s got two problems to overcome. The first problem is one of time…she wants to grow more vegetables and herbs, but she doesn’t want to spend hours and hours doing it. And the other problem is space. Betty lives in your typical semi-detached house and has just a small back garden. The back garden measures approximately 25 feet across and 20 feet deep. There was a lawn – but we could never get it to look great so we decided to make a small vegetable garden. And we set a goal to see what we could grow by investing just 10 minutes a day on the garden. We created 3 deep beds that are approximately 3 foot wide by 9 foot long. There’s a path between them, and a small 8 x 6 greenhouse. Why 10 Minutes A Day? 1. All vegetables produced in the garden should taste great. Most produce that you buy in the supermarkets is grown for every reason except taste. 2. Be easy to grow, simple to look after and better quality than can be brought in the Supermarket. 3. Above all it tastes great. You CAN grow your own vegetables, even if space or time is limited, and you will be amazed by the taste. To start with we’ll be aiming to post one new video episode a week. That frequency will increase at some stage later in 2012. All episodes will first appear on my YouTube channel before they are embedded here. There will also be detailed text/image posts here on Learn How To Garden Dot Com as well. Some of those will relate to the 10 Minute Gardener – and some will relate to different gardening topics too. 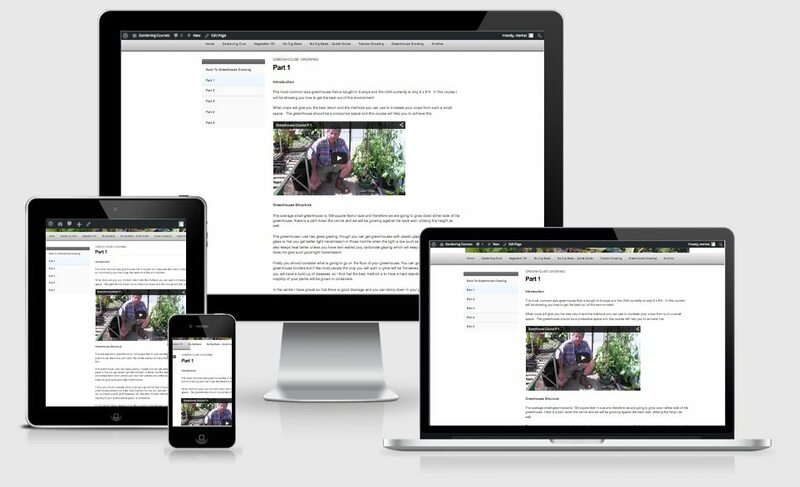 So there will be lots of content for you to check out that will help with your gardening. You can help shape what gets published both here on the website and in the 10 Minute Gardener show. If there are any questions you have, simply use the Contact form and send me an email. I can’t guarantee to answer every question…but I DO read all my email. Or you could ask a question by using the ‘comments’ section below. Watch out for the 10 Minute Gardener Episode 1 next week!